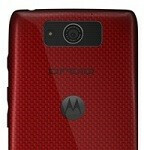 The reinvention of Motorola is nearly at hand as we get a peek at yet another iteration of the famed DROID line-up. This time it is the DROID Ultra dressed in red, showing off front and back poses. 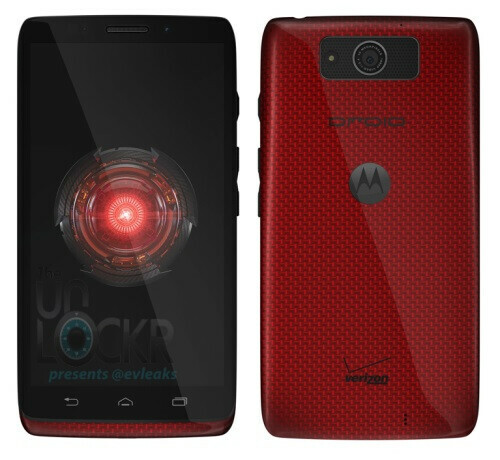 We have seen similar color schemes of the DROID RAZR in the past as Verizon employee only “Limited Editions” with serial numbers and everything. It looks as though Motorola is going to take the color mainstream and share with the rest of us. Today’s leak comes courtesy of @evleaks and while the rendering looks nice, we would not mind learning more about what makes this device tick. Verizon is holding a media event on July 23rd, and the speculation is that several new Motorolas will make their appearance at that time with a possible on-sale date of August 8th (or thereabouts). What do you think? Is the color a nice change of pace for you? Nice. This time its not a Little bit of red around it. They actually did the weave in red. Looks good! I like that little hint of red at the chin. Looks a lot better in red than white. it is probly the employee edition. they always do a red one for employees. What was motorola's 2012 flagship????? (Droid) Razr HD. It slipped in under the radar and was quickly usurped as Verizon's flagship by the Droid DNA. You know that warm fuzzy feeling you get when you look at a render of your next phone while wearing something warm and fuzzy? I just hope this one turns out better than when I decided the 'Vigor' was the one for me. I haven't owned a Motorola since my first phone back in 2001. I'm feeling a bit vulnerable. Be gentle, Moto. xD well if it helps after all the phones i've had the MAXX HD still holds true as my favorite. look at my phone profile to give you an idea of how big a deal that is and yes, i keep it updated. I would like that device actually. I would like to buy that just to have it because it is red. Who cares just show the real X phone. My fault on my extra comments I made. Having issues with my signal in the building. I don't know why everyone is getting so worked up over the Moto X. This appears to be a much better phone. If they can put a snapdragon 800 cpu and a 1080p display with a huge battery it would make it better than the S4 and HTC One. Not so certain about it beating the Note 3 though. Good thing my upgrade eligibility is 8/15/2013. What, you don't have the 15th month, Jupitember, in the UK? Sounds like a rather inefficient use of a calendar year.